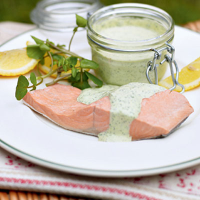 Light, poached salmon and summery watercress make this the perfect substantial picnic dish. To save time, you can prepare the salmon and mayonnaise a day ahead. Place all but the salmon in a pan with 350ml water. Bring to the boil. Add the fish, cover the pan and take off the heat. Leave for 12 minutes, or till the salmon is just cooked. Remove the fish from the liquid; set aside. Place the watercress and lemon juice in a blender and whiz till fine (or chop by hand and stir in the lemon juice). Put the egg yolk and mustard in a bowl with some salt and black pepper. Whisk well, then add a drop of oil and whisk until incorporated. Keep adding the oil, drop by drop, till the mixture thickens, then add the rest of the oil in a fine, steady stream. Beat in the watercress purée and season. Transfer to an airtight container and chill until needed. To serve, spoon some of the mayo over the salmon and serve with lemon wedges. Pass around the remaining mayo separately.